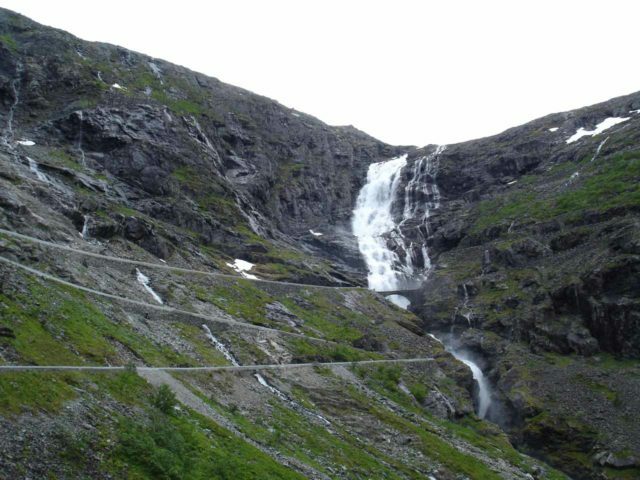 Stigfossen and Tverrdalsfossen were the pair of main waterfalls surrounding the famous 11-turn serpentine road Trollstigen (“the troll ladder”). 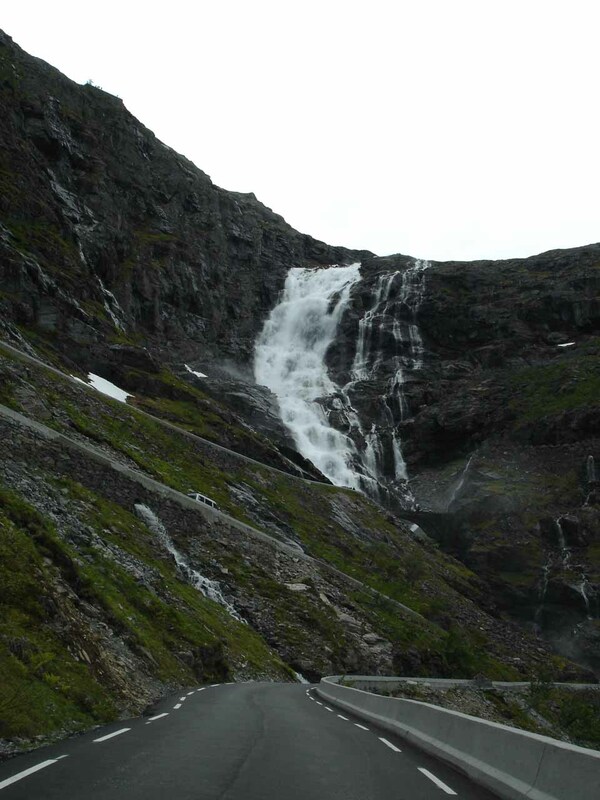 This memorable scene of steep switchbacking roads where we kept seeing one waterfall or the other at each switchback very much reminded us of another famous serpentine road with a pair of waterfalls flanking it that we encountered earlier on our June-July 2005 trip – Stalheimskleiva. Having gone through that other serpentine road, we knew what to expect in terms of taking it slow while also looking for opportunities to pull over and relish in the glorious scene around us. 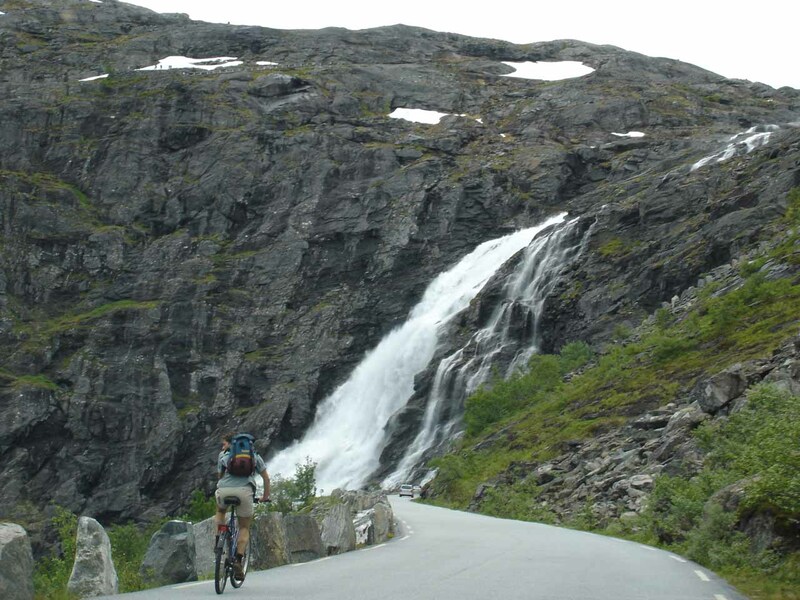 We also noticed some people on mountain bikes as well as a handful of people even walking parts of the old packhorse road called Kløvstien. 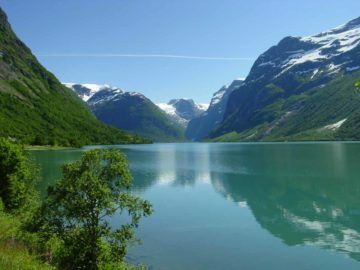 Kløvstien was once the main means of travel between Sunnmøre and Romsdal Counties before modern changes were made to accommodate automobiles. 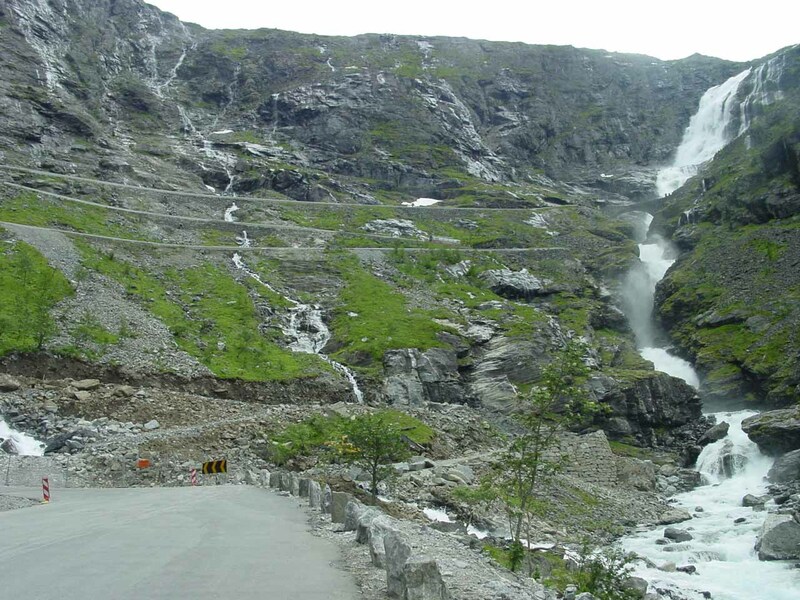 Prior to these developments (especially the Trollstigen itself), the 800m wall was impassable. 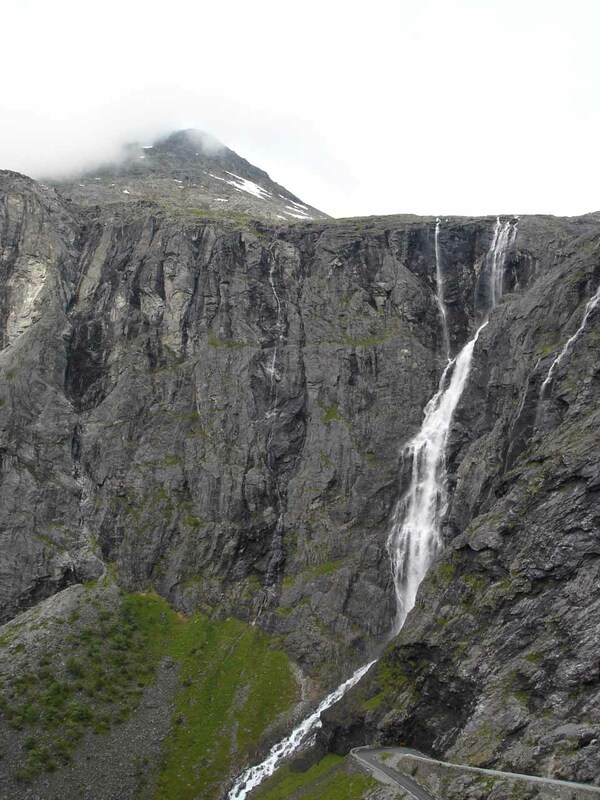 The larger waterfall that we noticed as we approached Trollstigen was Stigfossen, which we thought was the main feature waterfall of the two. 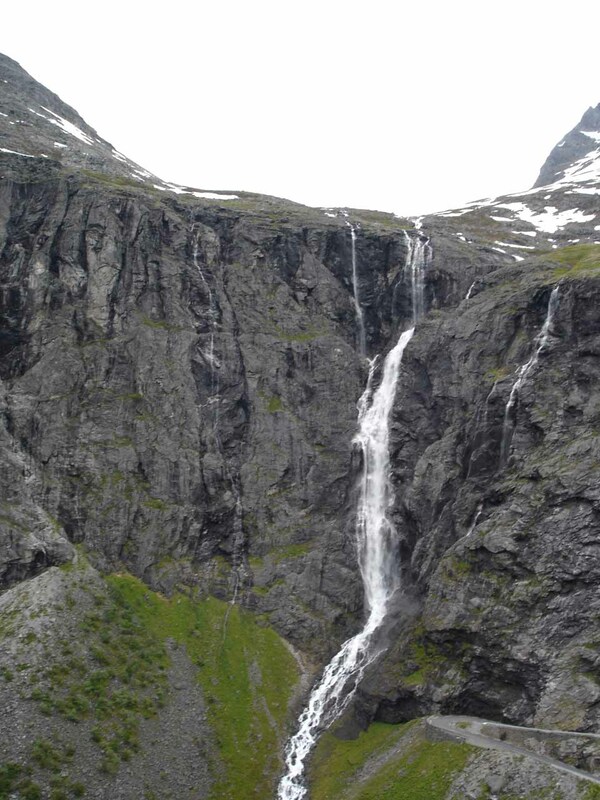 We were able to see this 180m waterfall from various angles. 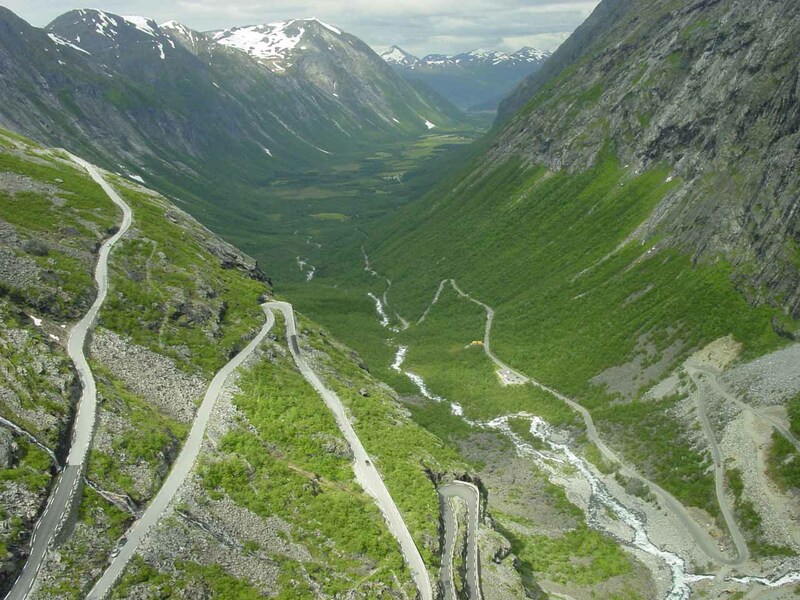 The progression for us started with a full frontal view near the bottom of the road before Trollstigen’s first switchback. 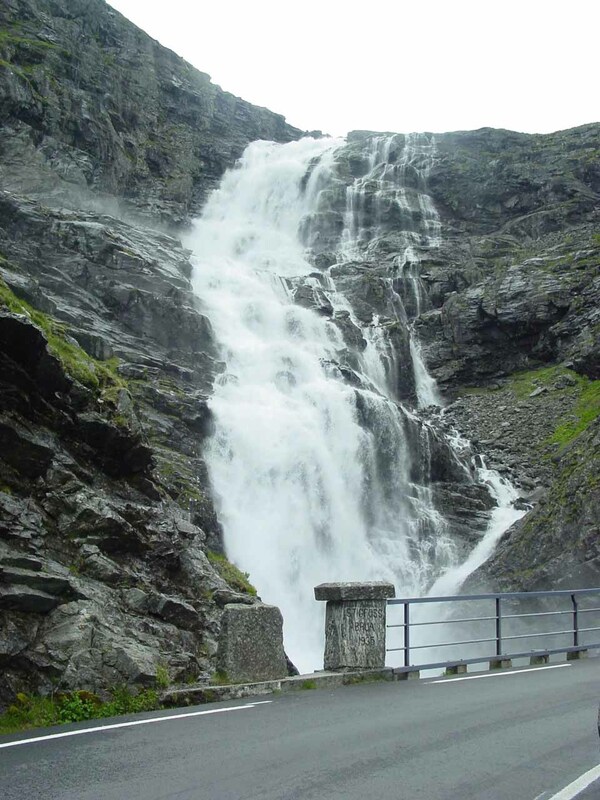 More than two-thirds the way up the road we then approached the bridge Stigfossbrua where we got a little sprayed by the mist of Stigfossen’s uppermost sections of its cascade. 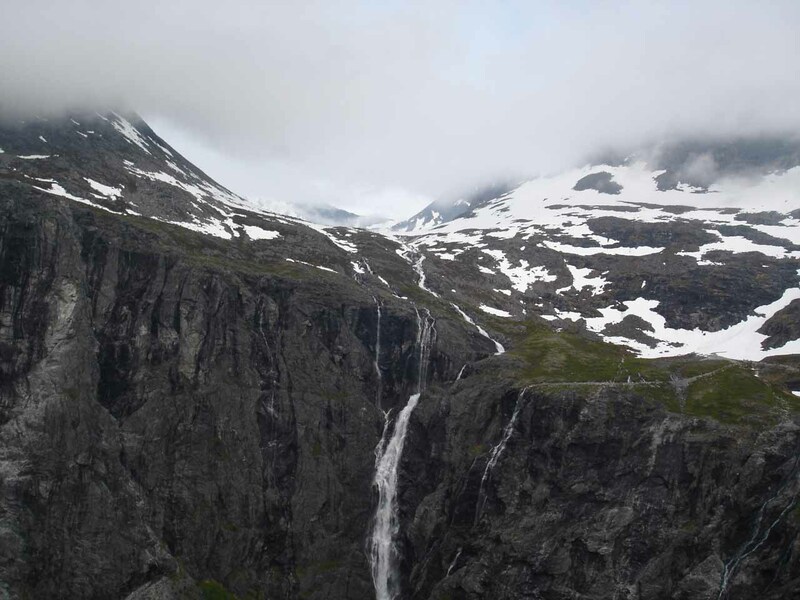 Ultimately, when we reached the very top of Trollstigen at Stigrøra, we then took a short and well-developed walking path down to an overlook. 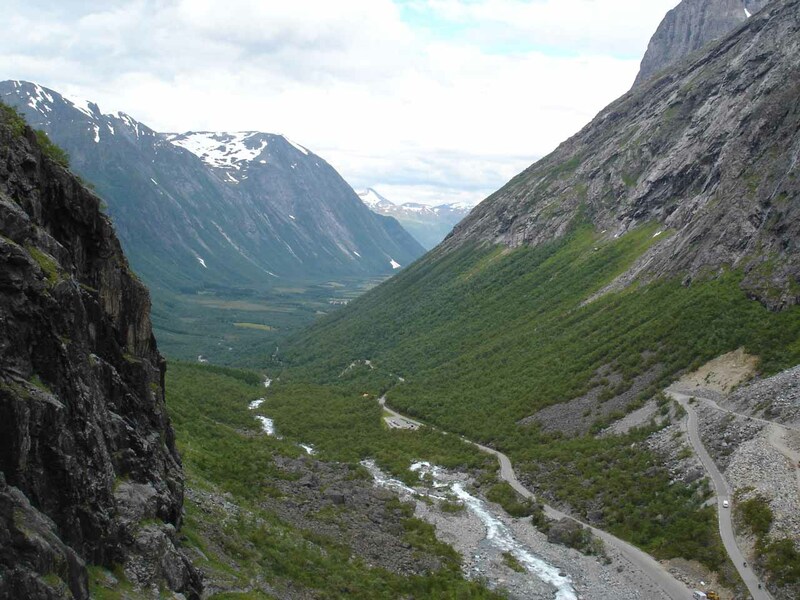 This overlook revealed the switchbacks of Trollstigen along with a partial view of Stigfossen and the valley Isterdalen beyond the bottom of the serpentine road (as shown at the top of this page). 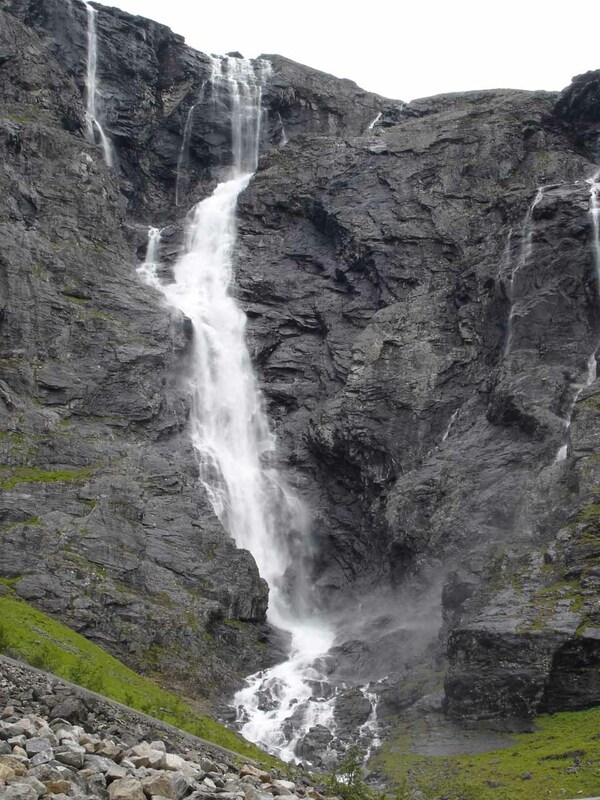 Tverrdalsfossen was the other waterfall tumbling opposite Trollstigen of Stigfossen. 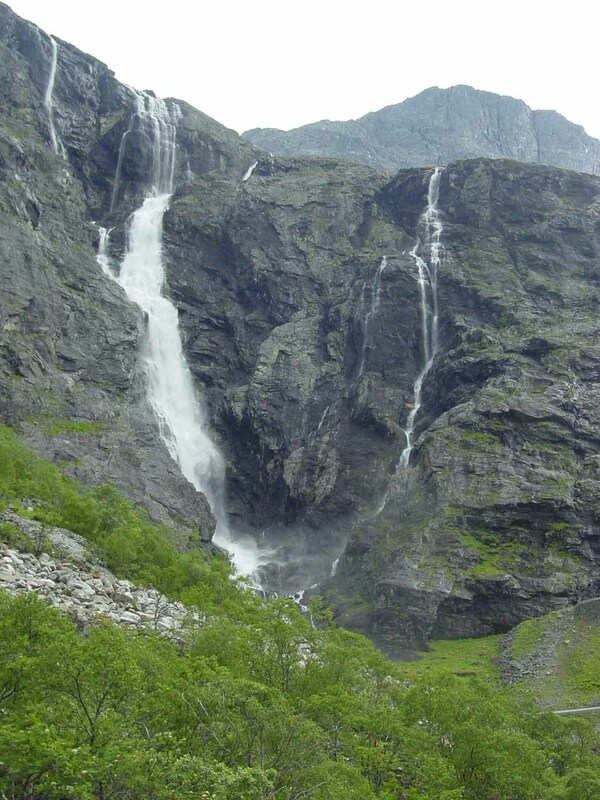 We actually didn’t know about this semi-official name of the falls on Tverrelva because Norgeskart didn’t seem to acknowledge this name. 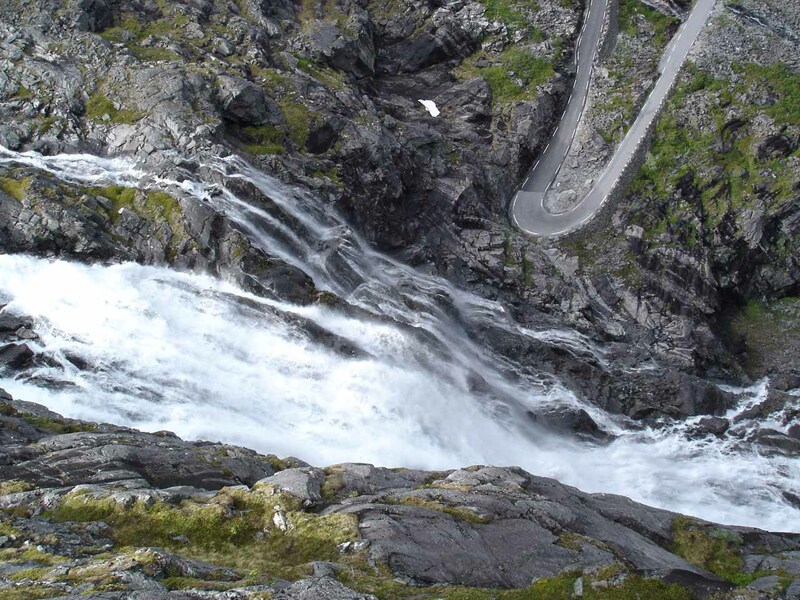 So for the longest time, we were informally calling it “Trollfossen” until we looked in our Adventure Roads in Norway book after the trip and noticed its more formal name in there. 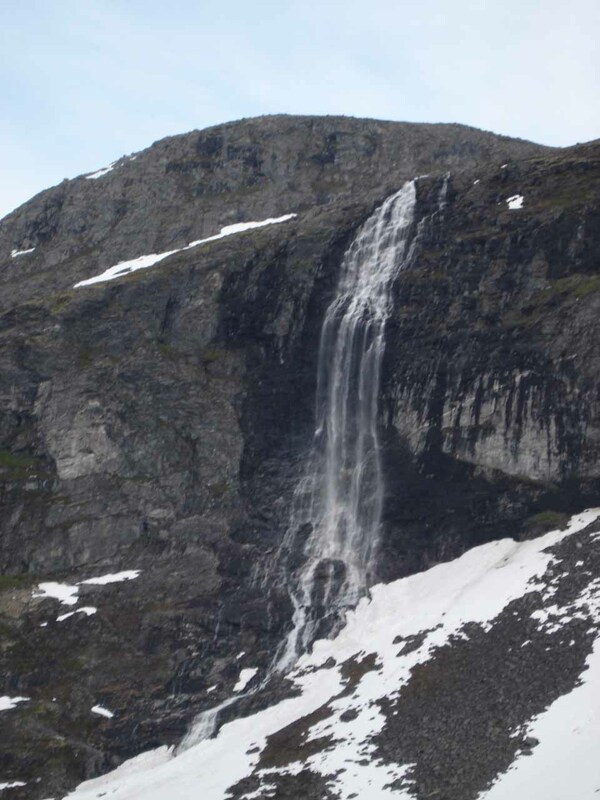 In any case, this waterfall was said to be taller than Stigfossen, and we would repeatedly see this falls from higher vantage points as we would approach every eastern switchback. 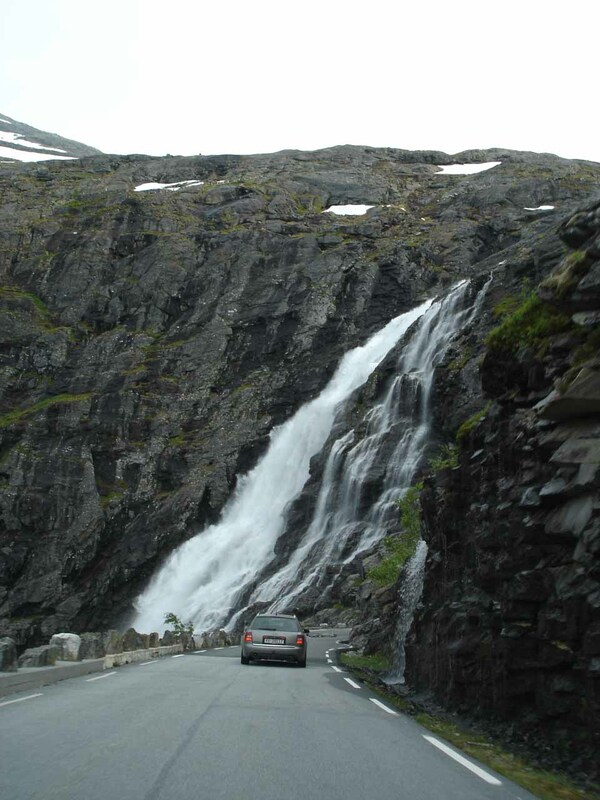 Unlike with Stigfossen, there seemed to be fewer pullouts or opportunities to better enjoy this waterfall outside of the car. 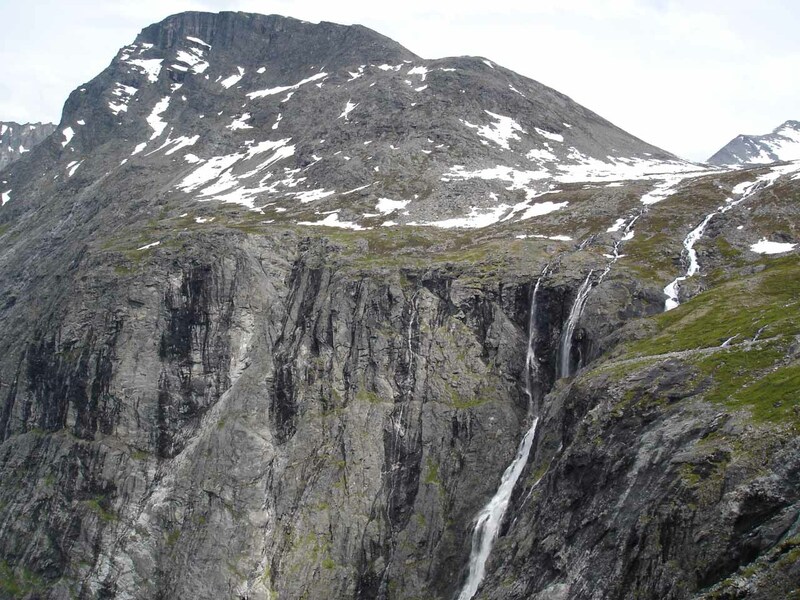 Both waterfalls had good volume though Stigfossen’s volume was much more significant and probably most likely to be year-round. 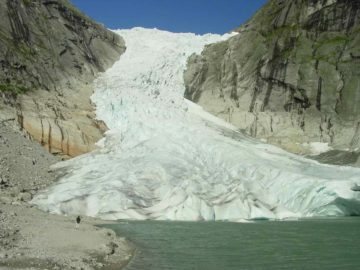 That was probably due to the fact that it was draining at least two major lakes (Bispevatnet and Alnesvatnet) as well as the melting of some receding glaciers. Meanwhile, Tverrdalsfossen drained only the lake Stigbotnvatnet and we can’t say for sure if it does or does not flow year-round. 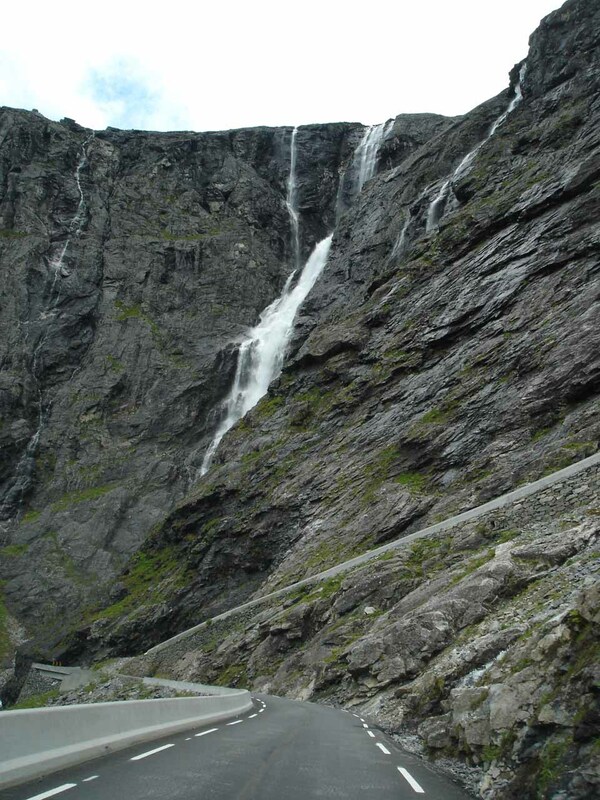 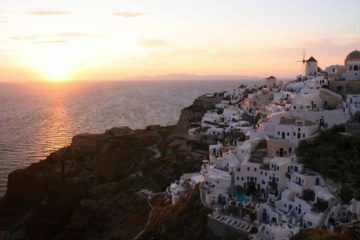 That said, it was certainly voluminous and significant during our visit in early July 2005. 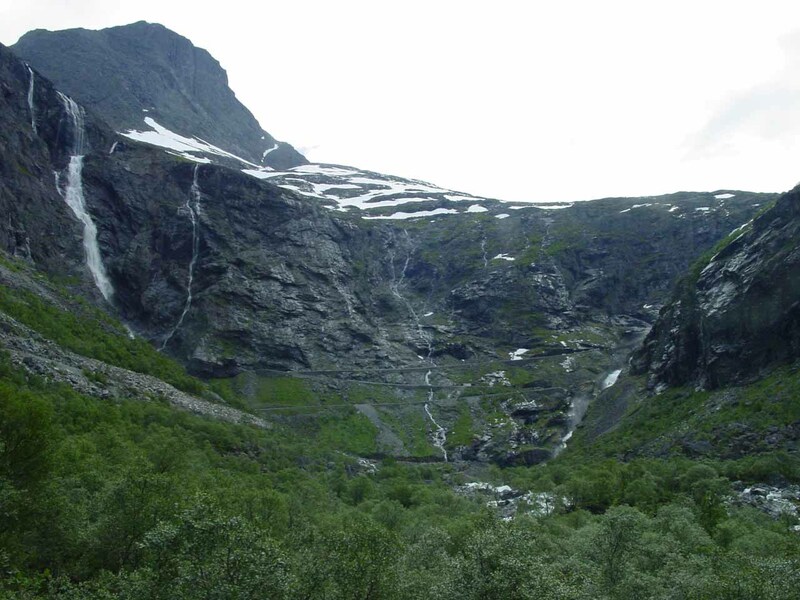 To not get confused about which waterfall is which, as you face Trollstigen on the ascent, Stigfossen is the waterfall on the right while Tverrdalsfossen is the waterfall next to the switchbacks on the left. 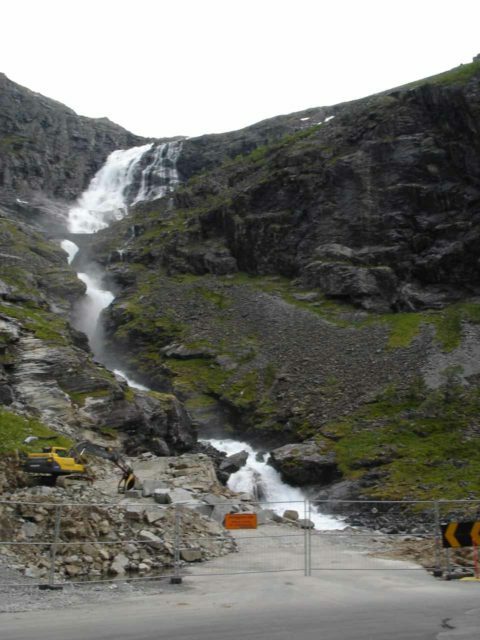 During our visit, there was quite a bit of construction work going on, especially near the bottom of the road. 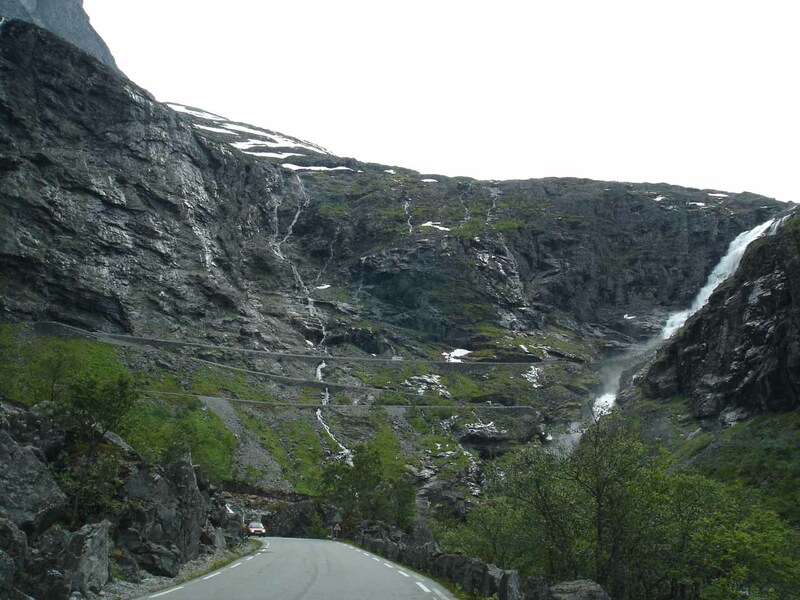 Julie and I had read a sign there talking about how a 600m stretch of road covering a pair of switchbacks were being re-routed because of its vulnerability to rockfalls. 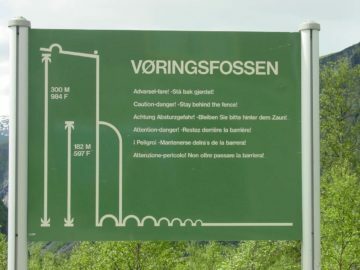 From looking at the top down photo shown on the sign, a combination of the steep walls of Trollstigen combined with the water from Tverrdalsfossen seemed to present an engineering challenge. 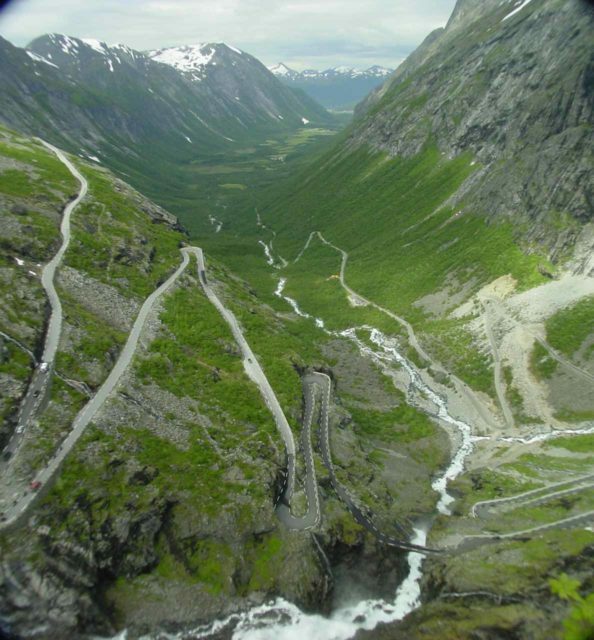 In any case, I’m sure by the time you get to ascend or descend Trollstigen, the driving experience will be quite different from what Julie and I were able to do. As Julie and I read more about Trollstigen, we learned that it opened in July 1936 after eight years of construction under the reign of King Haakon VII. Given its dramatic ascent (or descent) between the two giant waterfalls, beneath several majestic mountains (many of which were named like Kongen [the King] and Dronninga [the Queen]), and capping it off with an incredible panorama looking back down the valley Isterdalen, it was said that Trollstigen was the most traveled tourist road in Norway. We can probably corroborate this claim given how many people we had to share the narrow serpentine road with on our visit. 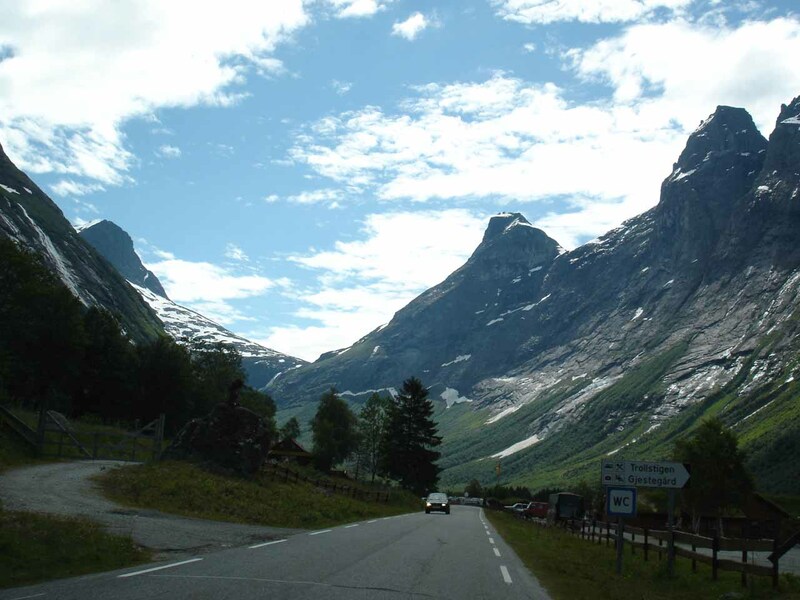 Supposedly, the Norwegian road authority, Statens Vegvesen, was said to have big plans for the stretch of Road 63 that included Geiranger and Trollstigen. 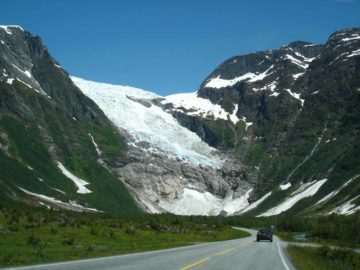 They wanted to make the so-called Atlantic Road as part of the National Tourist Road system to further establish Norway as a self-driving destination. 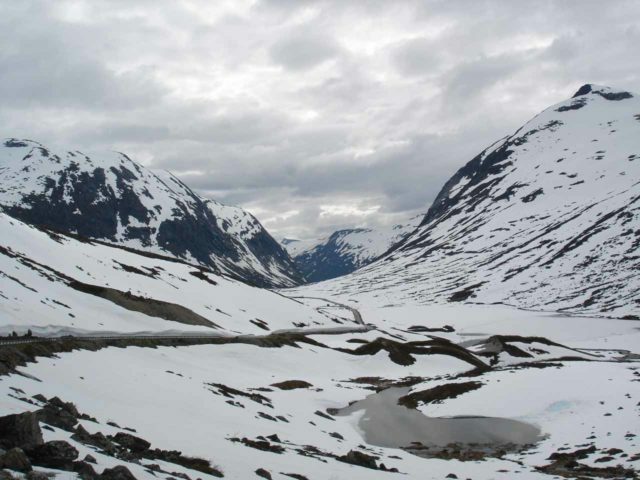 We’re not sure if these big plans have been completely executed or not, but it seemed to make a lot of sense given the concentration of seemingly iconic sights along this route. 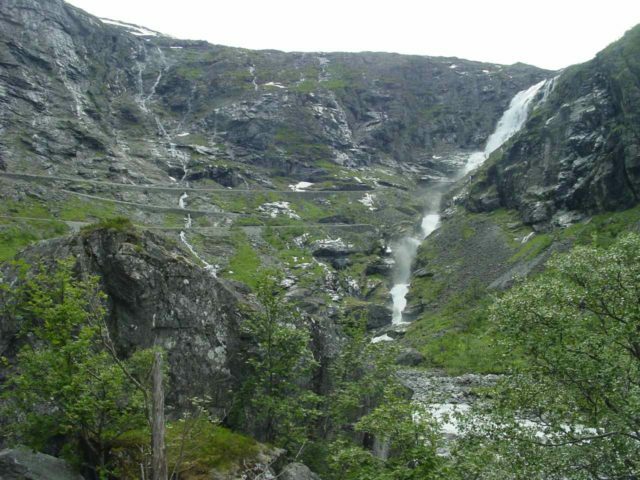 Stigfossen and Tverrdalsfossen reside in the Rauma Municipality. 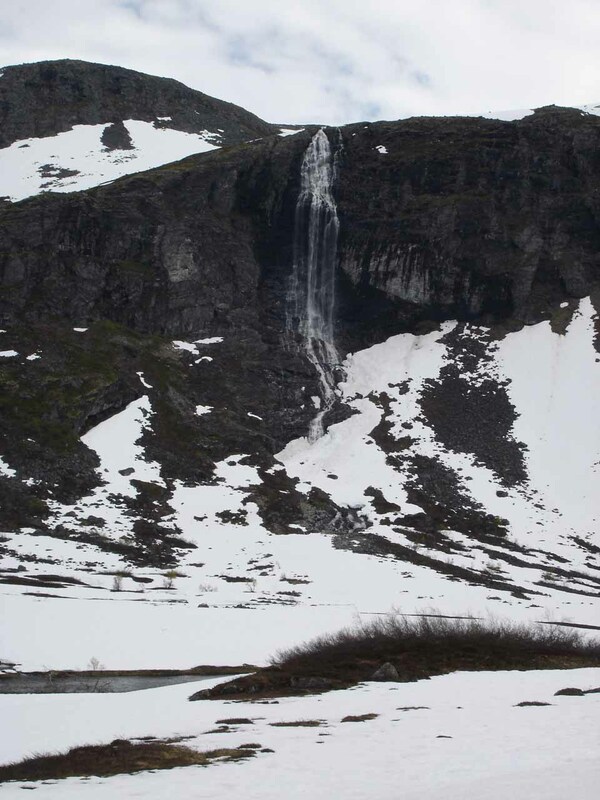 For information or inquiries about the area as well as current conditions, visit their website or Facebook page. 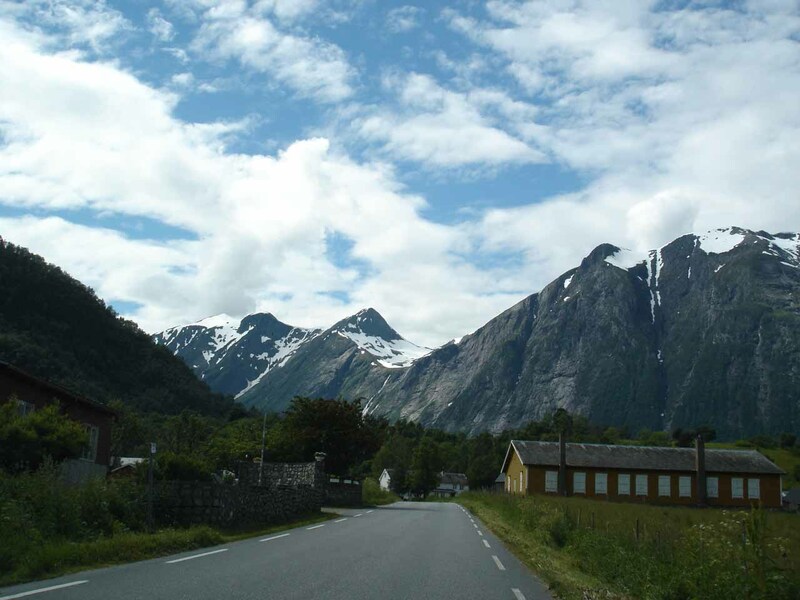 From the junction of the E136 and Road 64 in the town of Åndalsnes, we drove southeast along the E136 for about 4.5km to the junction with the Road 63 to our right. We then crossed the bridge over the Rauma River and followed the Road 63 for the next 9km to the first switchback at the bottom of Trollstigen. 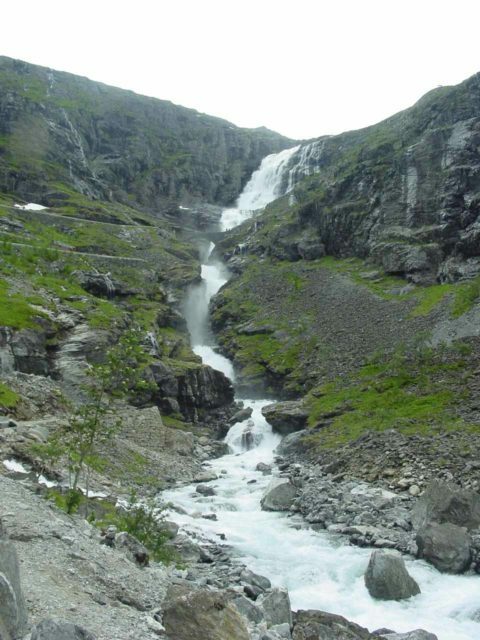 Going in the other direction from the town of Sylte (on the north shore of Norddalsfjorden; about 33km from Geiranger with a ferry ride across the fjord from Norddal), we had to drive about 36km through highland moors of Valldalen to the top of Trollstigen at Stigrøra. This entire stretch would be along the Route 63.